The radical message of Jesus is that there is only one alternative to the common method of confronting violence with more violence. 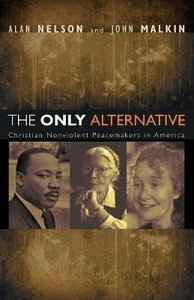 The Only Alternative: Christian Nonviolent Peacemakers in America explores the spiritually active practice of compassionate nonviolence. Here is a journey through the lives of seven courageous American peacemakers who have embodied Christian nonviolence and dedicated their lives to addressing the suffering caused by racial discrimination, slavery, poverty, militarism, nuclear weapons, prisons, environmental degradation, and the psychology of fear and hatred. Here are highlights from the inspirational ideas and actions of Martin Luther King Jr., Dorothy Day, Thomas Merton, Rufus Jones, Thomas Kelly, Jim Douglass, and Kathy Kelly. They remind us that to be Christian is to use the power of love to transform spiritual, economic, and social violence. The great turning from violence to nonviolence is the story of Christianity in America. There has never been a more urgent time for this revolutionary teaching to be heard, understood, and lived. ""It is no longer a choice, my friends, between violence and nonviolence. It is either nonviolence or nonexistence ..."" --Martin Luther King Jr. Human beings are now facing the stark choice between survival and destruction amid myriad forms of violence. The nonviolent peacemakers within this book can inspire the peacemaker within each of us to cultivate a direct relationship with God and love through contemplation, meditation, writing, and compassionate action based in the life and teachings of Jesus. Alan Nelson was a clinical psychologist who worked closely with Carl Rogers. In 1978 Nelson founded a nonprofit organization called the Peace Project, which he directed until his death in 2002. He also helped to create and lead the American Psychological Association's Peace Psychology Division as well as Psychologists for Social Responsibility, an independent nonprofit organization. Nelson's work appeared in the American Psychologist, the Journal of Peace Psychology, and the Journal of Humanistic Psychology. John Malkin is a writer and musician based in Santa Cruz, California, where he hosts a weekly radio program focusing on social change and spiritual liberation. He is the author of Sounds of Freedom, a book of interviews with fifteen musicians. His interviews and writing have appeared in numerous magazines, including Sojourners, Buddhadharma, Shambhala Sun, Namarupa, Z Magazine, In These Times, Mandala, AlterNet (www.alternet.org), and the Sun. About "The Only Alternative: Christian Nonviolent Peacemakers in America"
Alan E. Nelson (EdD., University of San Diego) is a leadership development specialist. He was a pastor for more than 20 years and is the author of fourteen books on personal growth and leadership. He is the founder/CEO of KidLead, an organization dedicated to training effective, ethical leaders. He is a columnist for Rev. magazine.